Rutland Water Reservoir was constructed by Anglian Water Services (AWS), to store water from the Rivers Wellend and Neane before treatment at Wing Water Treatment Works. AWS will soon need to find additional water to meet the demands of the region for supplies to new homes. To address this, AWS concluded that the additional supply would need to be met by increasing the capacity of Wing Water Treatment Works. The area is designated as an important nature conservation site, and falling water levels from the additional draw required by the upgrading of the treatment works may damage the habitat for the local water birds. AWS therefore plan to pump additional water to the area and create new lagoons, effectively creating a new habitat to prevent bird numbers decreasing and keep within legislation surrounding international nature conservation areas. 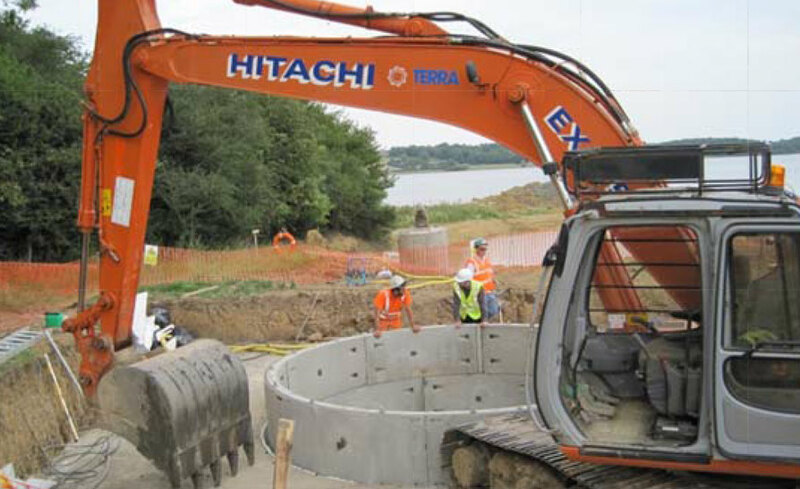 Terra Solutions were tasked to construct a new pumping station within the habitat using smoothbore precast concrete shaft segments. The shaft, measuring 4.5m internal diameter was to be sunk to a depth of 7.5m below ground in a very sensitive environmental location. The project required a diligent and professional approach from both the management & installation teams as the project was being carried out in an isolated rural location and a considerable distance from the main compound and working area. Special consideration was given to required equipment and supplies to allow the team to work remotely, efficiently and safely.